2015 has not only seen an increase in bird numbers, but the sanctuary’s red squirrel colony has also expanded. 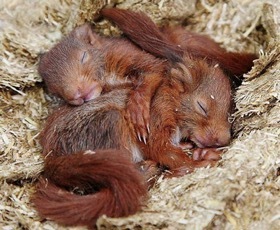 During April three kits have been born to one of our eight adult red squirrels, after a gestation period of 38 days. The young are very vulnerable when born, being deaf and blind and totally dependent on their mother. Within 21 days their bodies are covered with hair and their eyes and ears open after three or four weeks. As usual there were no obvious signs in the enclosure that babies had been born until about 40 days later, when they are able to eat solid food. After that, they take trips out of the nest to find food, still returning to suckle from their mother until fully weaned at 8 to 10 weeks. Red squirrels that survive their first winter have a life expectancy of at least 3 years - in the wild, many live for up to 7 years; in captivity, up to 10. The Sanctuary’s squirrels have plenty of room to roam and play, with three large enclosures connected by tree top level corridors. These allow plenty of room for individuals to “enjoy their own space” - red squirrels are solitary animals and their social organisation is based on dominance hierarchies within and between the sexes, so plenty of spacial independence is essential. The sanctuary’s new editions will move on once they become mature; in order to maintain a healthy gene pool, young from this colony will be swapped for squirrels from other conservation projects or donated to one of the successful release schemes now established throughout the country, by conservation groups such as the Red Squirrel Survival Trust in Anglesey and the Wight Squirrel Project. Assisted by such schemes, the red squirrel continues to recover in population in specific areas of the U.K. - particularly in Scotland, the Isle of Anglesey and the Isle of Wight. This correlates with the decrease in grey squirrel numbers, in turn accelerated by the increase in pine marten populations, the grey squirrel’s main predator.